Matt pigments simulate the look of letterpress. Pigment foils should always be considered when printing on dry or textured papers and boards. Strong uniform colour is achieved. Lithographic inks often look dull or lose their strength of colour and screen printing is not without its problems. Hot foils is a dry solvent free option with no lengthy setup time or cost. Fields of application are graphics, plastics, promotional items, coding & self adhesive labels. Over 50 gloss & 30 matt pigments available from stock. 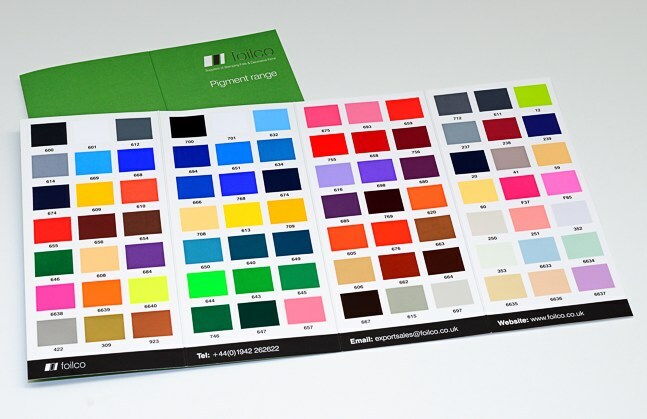 Pantone matching available with low minimum order quantities and a quick turnaround to meet print demands.